Happiness has been a topic of interest for many centuries, starting with Ancient Greek philosophy, post-Enlightenment Western-European moral philosophy (especially Utilitarianism) to current quality-of-life and well-being research in social, political and economic sciences. Nowadays, happiness as a concept seems to be readily embraced by the majority of people and appears to be more valued than the pursuit of money, moral goodness or going to heaven. Not surprisingly, during the past thirty years and especially since the creation of positive psychology, psychology too has turned its attention towards the study of happiness and well-being. First of all, Western countries have achieved a sufficient level of affluence, so that survival is no longer a central factor in people’s lives. Quality of life is becoming more important than matters of economic prosperity. Personal happiness is becoming more and more important because of growing trends towards individualism. Finally, a number of valid and reliable measures have been developed, which have allowed the study of well-being to establish itself as a serious and recognised discipline. The answer is simple but a little unexpected – almost everyone. The collated results of 916 surveys of 1.1 million people in 45 nations show that, on a scale of 0 to 10, the average score was 6.75. So, people are generally more happy than they are unhappy. Between 84 and 89% of Americans, for example, score themselves above neutral in happiness inventories. The majority of countries are well above the neutral point, with the exception of former Soviet bloc countries (e.g. Bulgaria, Russia, Belarus, Latvia) where the average is somewhere close to 5 on a 10-point scale. Certain groups usually have the lowest level of happiness, including: those who have recently lost their partners, new therapy clients, hospitalised alcoholics, new inmates and students under political repression. What is even more fascinating is that well-being is associated with longevity. One study analysed the application letters of nuns entering convents at the age of 18 for expressions of happiness. It’s important to note that all of these nuns had a very similar, moderate lifestyle – they didn’t smoke or drink, had a balanced diet and worked as teachers. The results indicated that happiness expressed in these letters at the age of 18 predicted life duration. Years later, at the age of 85, 90% of nuns whose happiness was in the upper quarter were still alive compared to 34% of those who were least happy. Even at the age of 94, over half (54%) of the happiest nuns were still alive, while only 11% of those whose happiness fell into the lowest quarter were still living. So it looks like happiness can buy you an extra 9.4 years of life! There is a big debate in psychology about whether happiness can and should be measured objectively or subjectively. Some argue that it cannot possibly be measured objectively because none of the obvious behaviours can be linked to happiness in a reliable manner. Even an outgoing and friendly appearance, which is so frequently observed among happy people, can be put on as a mask by those who are unhappy. Others, however, including Nobel Prize winner Daniel Kahneman, believe in the objective assessment of happiness, which could be gathered from averaged out multiple assessments of people’s moods over a period of time. This way, a happiness assessment would not need to be tied to memory and retrospective accounts. Nevertheless, the subjective paradigm appears to prevail at the moment, and this is what I’ll be focusing on here. The first, cognitive part of subjective well-being is expressed by life satisfaction. Life satisfaction represents one’s assessment of one’s own life. One is satisfied when there is little or no discrepancy between the present and what is thought to be an ideal or deserved situation. On the other hand, dissatisfaction is a result of a substantial discrepancy between present conditions and the ideal standard. Dissatisfaction can also be a result of comparing oneself with others. Affect represents the emotional side of SWB. The notion of affect comprises both positive and negative moods and emotions that are associated with our everyday experiences. 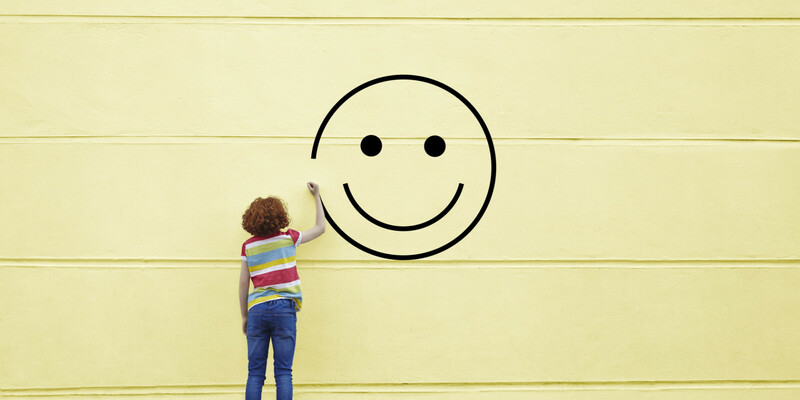 Even though common sense would suggest that we should feel most happy if we experience the maximum amount of intense positive affect and not very frequent negative affect, researchers demonstrate that this is not the case. They show that, whilst it is very important to experience positive affect often, the intense positive affect is not necessary for well-being. It appears that intense positive emotions usually come at a price, as they are often followed by periods of low affect. Also they can negatively effect the evaluation of subsequent (usually less intense) positive experiences. Back to Practical Matters – Can We Increase Our Subjective Well-Being? A number of theories say that it is impossible to permanently change someone’s level of happiness. One of these theories, the so-called ‘Zero-sum’, says that happiness is cyclical and that happy and unhappy periods follow each other. Any attempt to increase happiness will soon be nullified by a consequent unhappy period. Another theory claims that happiness is a fixed characteristic and is, therefore, not open to change, although happiness is not quite as stable during adolescence and early adulthood and can be affected by major life changes. Therefore, it is more likely that happiness ‘tends to get’ fixed, rather than being fixed from the very beginning. Adaptation theory predicts that although happiness reacts at negative and positive life events, it returns to its baseline shortly afterwards. Lottery winners soon revert to their normal level of well-being, and paraplegics and quadriplegics also seem to adjust to their conditions and nearly come back to their previous level of well-being. It has been discovered that only life events which occurred during the past two or three months influence well-being. However, despite the evidence that people get adjusted to both lottery winning and spinal injuries, there are certain conditions (such as widowhood, loneliness and injustice) to which people never adjust completely. What is Important in Creating Happiness and What is Not? If you had to guess, which ones of the following would you say are important for happiness: money, friends, having children, getting married, looks, health, moving to a better climate? Is your age important? What about your level of education? The safety of your community? Common sense predicts that the most likely source of satisfaction with life is objective circumstances but often this is not the case. There is very little relationship between happiness and many life circumstances we consider so important that we would sacrifice years of our lives in order to have them. Compare your thoughts with the table below, which summarises the research findings on the correlates of happiness, and see whether you’ve got it right. A word of warning here – unravelling causes and effects is not easy. Although these correlates are often considered to be the causes of happiness, they may as well be its consequences. For example, it may be that having good friends brings happiness or that those who are happy attract good friends. Diener and Seligman in their study of exceptionally happy people (the upper 10% of 222 college students) found only one main difference between the happiest and the rest of the students. The very happy people had a rich and fulfilling social life. They spent the least time alone, had good relationships with friends and had a current romantic partner. They did not have fewer negative and more positive events, nor differed on the amount of sleep, TV watching, exercise, smoking, drinking, etc. Marriage usually leads to a rapid increase in SWB, which, unfortunately, comes down after a while. However, it does not return to the starting point, but stays at a higher level than before. So marriage changes the set point of SWB, although this change is not large. However, if your relationship is on the rocks, you are likely to be less happy than people who are unmarried or divorced. In three months, the effects of being fired or promoted lose their impact on happiness level. Winning the lottery often leaves people less happy. Real income has risen dramatically in the prosperous nations over the last 50 years, but levels of SWB have stayed flat. Recent changes in an individual’s pay predict job satisfaction, but average levels of pay do not. People in wealthy nations appear to be much happier than in poorer ones but this finding does not hold true for some nations (e.g. Brazil). Desiring wealth leaves one less happy. People who go to church are happier and live longer, although this may be explained by the social support that belonging to a religious community gives to people. Having children does not make you happier and having under fives and teenagers actually makes you less happy. Saying that, having children can make your life more meaningful, and also parents tend to live longer. Watching soap operas enhances well-being. All objective life circumstances combined account for not more than 10% of variance in well-being. Seligman introduces the happiness formula: H = S+C+V, where H stands for happiness, S for a set range, C for the circumstances and V for the factors under voluntary control. S is a genetically determined level of happiness, which remains relatively stable through the life span and returns to its original point soon after the majority of significant life events. It determines happiness up to about 50%. C is the circumstances we’ve already considered (and accounts for about 10%). So, if you want to be happy, get married, join a church but don’t bother about making more money, staying healthy, getting educated or moving to a sunnier climate. Finally, factors under voluntary control (V) refer to intentional and effortful practices a person can choose to engage in (which account for about 40%).